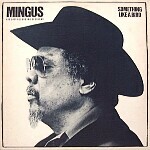 CHARLES MINGUS "SOMETHING LIKE A BIRD"
(P)(C)1980 ATLANTIC RECORDING CORP. INC.
All arrangements and orchestrations were realized by Jack Walrath (for Something Like A Bird) and Paul Jeffrey (for Farewell Farwell) under the supervision of and as dictated by Charles Mingus, in person and through the use of tapes and piano sketches. Recorded, remixed and mastered at Atlantic Studios, New York, NY. The basic pattern for the solos consists of one initial chorus for each soloist, followed by exchanges of 16, 8, 4 and 2 measures, all in the listed sequences. The exceptions are noted below. George Coleman plays two initial choruses on tenor saxophone, and in the sequence of exchanges one full full chorus instead of 16 measures. Ken Werner plays two chorus; his second chorus is in dialogue with the ensemble. The alto saxophone soloists play two initial choruses, except Akira Ohmori who plays one chorus. Before the sequence of exchanges, McPherson, Konitz and Coleman play an additional full chorus each. The side break is done with a fade out during the ensemble following the keyboard solos. To avoid the loss of music due to side break, Side Two opens at the point where this ensemble begins.